Since we are under a hard freeze warning we have several suggestions for your property to help reduce damage. A hard freeze is anything that is a little cooler than 32 degrees and last several hours. A general freeze can get down to 32 degrees but can generally run a little warmer. Both of these weather warnings can lead to some damage to your tropical plants. However, once all the cold weather is in the clear you can have the plants damage trimmed off and everything will be fine. To reduce damage you should also water during the day before a freeze that night. This will replenish the lawn and the water will absorb the heat from the day and radiate through the night. Also, if you wanna go to the extreme you can always cover some of your plants. You would wanna do this with a cloth, or a quilt or frost cloth that touches the ground to keep heat in. It is very rare that we get these temperatures in our area, but when it happens you should be prepared. 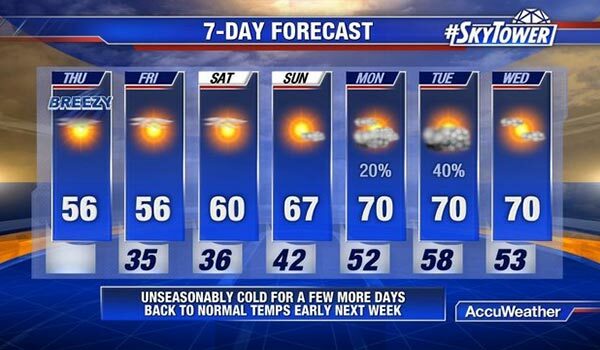 As temperatures drop across Florida, residents are searching for ways to keep more than just homes warm. Everything from crops, to pets, even planes, were affected by the unusually cold weather on Thursday. 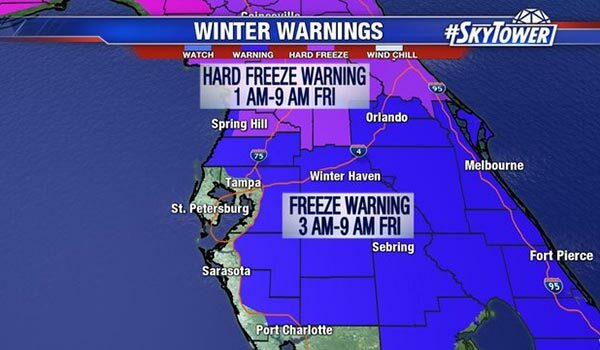 Except for the immediate coast, temperatures across the state will dip below freezing early Friday morning. A hard freeze warning – meaning temperatures below 28 – will be in effect from 1 to 9 a.m. for the northern Bay Area counties. A freeze warning – meaning temperatures below 32 – will be in effect for most of the rest of the area. As we move into 2018 we should equip ourselves with the tools to have a great looking yard. At this point, since things are a little slow, there are several things we can check up on. First, irrigation guys are usually slow this time of the year, so its best to try and take advantage of that and get them out and inspect the irrigation because going into Spring your irrigation will be extremely important because our springs are usually very hot and dry. You may have some mixed turf’s browning out from the cold weather so we will try and get as much St. Augustine as we can to take back over but everything will green back up in spring regardless.